Two marketers walk into a bar and sit down during Content Marketing World (here’s what I learned there last year). They’re chatting about their respective content programs and challenges. Marketer 1: What’s the primary goal of your content marketing program? Marketer 2: Thought leadership. What’s yours? Marketer 1: To drive high quality traffic with trusted content that yields subscribers so that by next year our nurture program generates 7% of pipeline and influences 40% of revenue. Which content marketing program do you think will continue to get budget? Perhaps that was a bit extreme, but it makes my point. I recently wrote Six Elements of a Results-Driven Content Marketing Strategy (subscription required) because I’d had far too many conversations with clients that sounded like “we aren’t sure our content marketing program is working/not getting enough out of it” despite the fact that they had no articulated strategy or clear goals. Our friends at CMI have shown that only 37% of B2B and 40% of B2C content marketers have a strategy. I have very little sympathy for the ‘it’s not working’ refrain if we can’t all agree on what IT was supposed to be in the first place. More prevalent in B2B conversations – but sometimes also part of the B2C content dialog – this vague statement suggests that our idea, put into the wild will be so amazing that prospects will start banging on our doors. Thought leadership is giving content marketers a bad name. It means one thing to your CEO: maybe it’s his name in lights on MSNBC or quoted in the Wall Street Journal. It means another thing to your head of product: she might think it’s the product management team being asked to speak at industry events and getting retweets from industry analysts. It means another thing to the agency you hired to do it: they think it’s driving traffic (if you’re lucky, maybe even engagement and conversion) based on keyword terms that are relevant to your target audience. It means another thing to your customers: unique, helpful ideas that make them think differently and contribute to their success. I’m not saying that it can’t be part of a goal – but the idea of thought leadership must be in service to an overarching business goal and you must have specific objectives and metrics that define whether you’ve achieved success. That means content marketers – regardless of industry – have to keep getting more and more comfortable with measurement. In fact, it’s one of my key takeaways from last year. Content marketers have the greatest maturity gap when it comes to analytical muscle for their programs. We do a lot of research on that topic and I’ll be digging into it when I hop to CMWorld in Cleveland in two weeks where I am particularly excited about the ROI/Measurement track. I’d love to hear who is doing really well and who is struggling to connect the dots. 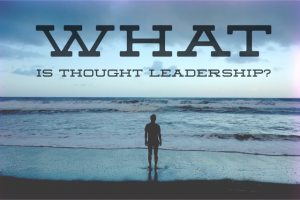 You make some great points around the confusion of Thought leadership, and especially how it can mean different things to execs, agencies, customers, etc. However, I think your cynicism for the topic blows right past the most obvious value that that a thought leadership campaign can offer to a B2B organization. Specifically, a well-executed thought leadership campaign that has industry leaders (executives, journalists, authors, speakers, etc.) engaging with a company’s brand/product can give tremendous cover to the sales team and make their job much easier. Of course, it would be insane to replace a sales team with a thought leadership team. But I also think it’s misguided to think that the decision makers are out “searching” for products/solutions in google. In my experience, they operate and react to what they’re hearing and seeing from the thought leaders they meet at events, hear on podcasts, read in newspapers/journals, etc. In other words, if you want to get the attention of c-level executives at Enterprise B2B organizations, it’s not going to come because you’ve better optimized the keywords you’re buying ads against, but rather, it’s much more likely to come because you’ve done the hard work of getting thought leaders to jump-start the conversations around your company’s solutions. Should a thought leadership team replace a sales team? Of course not. But can a well executed thought leadership campaign make the job of your B2B sales team much easier? I’d obviously argue: Of course! With all that said, I’m also fascinated by the idea of improving how we measure the effectiveness of our marketing campaigns… and hope to cross your path at Content Marketing World in a few weeks! Thanks a bunch Kristen! I agree that it would be great to meet up for coffee in Cleveland! And the early days building Rain City Guide was a blast. I felt like everywhere I turned there was fascinating stuff to learn in terms of both technology and marketing! Fun stuff! Kirsten, we need to talk about Quality. There’s a lot of content out, most is marketing followership, not thought leadership -simply because few business leaders are actual thought leaders. Marketing’s answer typically is to crank up the quantity to fight declining returns -it’s the marketing definition of madness: keep doing the same thing and expect more eyeballs. Add to this poor packaging, and you’re shedding lots of dosh down the drain. Thought leadership needs: a pig-headed editor, good content packaging (snackability is only the start, each element needs to stands on its own) and, yes, curation and engagement. 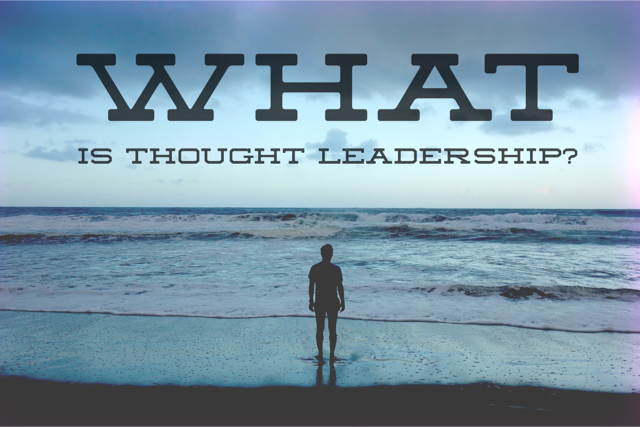 Thought leadership is a discussion -you heard it here first.